Texas 42 is a trick-taking game played with dominoes. It is also known simply as 42 dominoes. 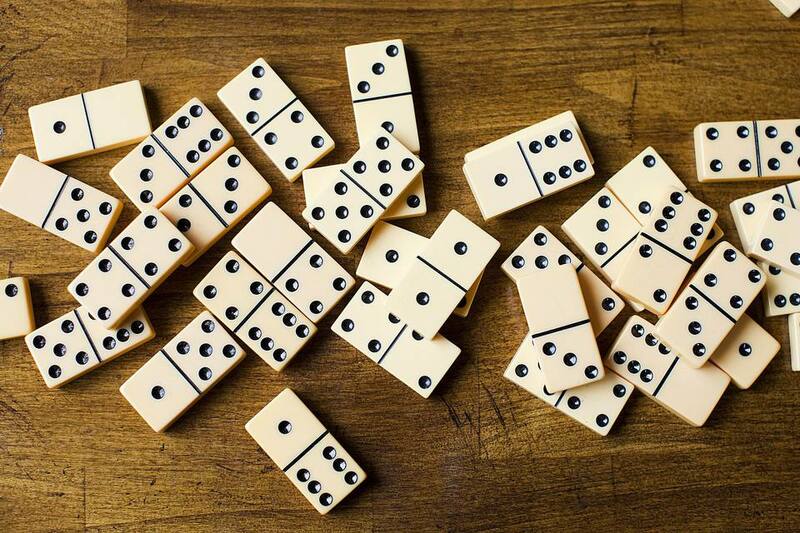 Folks in the Lone Star State love it so much that it was officially designated as the State Domino Game of Texas in 2011. Players: The game is played by two to seven players. Texas 42 is best when played with four players in two teams of two players each. Partners sit diagonally across from each other at the table. Equipment: One standard set of double-six dominoes. Goal: To be the first team to reach seven points (also known as "marks"). At the end of each round, five dominoes (known as the "count" pieces) are worth points. The blank-5, 1-4 and 2-3 are each worth five points. The 4-6 and 5-5 are each worth 10 points. The player who drew the blank-1 domino bids first. The minimum bid is 30. A player may pass rather than bid. If everyone passes, either the dealer bids or the dominoes are reshuffled and the next player becomes the dealer. The main benefit of bidding 84 rather than 42 is that a successful bidder will in two marks instead of one. The winning bidder chooses trump. This can mean designating a particular suit as trump (e.g., sixes, which would mean all dominoes with at least one six are part of the trump suit; or threes, which would mean all dominoes with at least one three are part of the trump suit), designating all double dominoes as trumps, or "follow me," which is the same as announcing "no trump." If at least one trump is played, the highest trump wins. If no trump is played, the highest number of the leading suit wins. The winner of the trick collects the dominoes and opens the next trick. Play continues in this way until the bidding team (or bidder) makes their bid or is prevented from doing so. Then marks are awarded to the winner. The score is calculated by giving one point for each trick and adding the values of the count pieces. If the bidding team (or bidder) makes their bid, they win one mark. If they fail to do so, the other team wins one mark.